Born in China in 1938, Ms. Jordan began to pursue her passion for fine arts at Smith College, and continued at the Torpedo Factory and the New Orleans Academy of Fine Arts. She proceeded to build her brand, participating as an exhibitor in group shows at the national exhibit of the New Orleans Art Association, Fest for All in Baton Rouge, La., and the juried show at the Masur Museum. One of her first solo shows was at The Long Gallery at the Ochsner Medical Center in 2000, followed by The Upstairs Gallery and the St. Tammany Art Association at the Holiday Inn in 2001. Some of Ms. Jordan’s other notable exhibitions include at the Café Degas, the River Road Juried Exhibit, the Louisiana Watercolor Society, and the Dominican Institute Arts Group Show. After Hurricane Katrina devastated her region in 2005, Ms. Jordan needed two years before she could paint again. The experience inspired her to deviate from the atmospheric landscapes she was known for and to begin creating bright acrylic canvases and abstract geometric forms that represents the “playful carnival aura” of New Orleans. 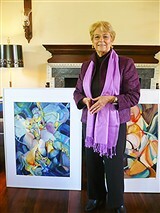 She also discovered an interest in watercolor on Yupo, and in creating large paintings that are “semi-abstractions of memories and metaphors: bridges, cities, [and] the cracks in between dimensions.” Over the past decade, she is proud to have sold more than 300 paintings and to be represented in the Bancroft Studio Gallery, the Lagniappe Gallery, and the Studio Angelico, among others. When Ms. Jordan wasn’t creating or displaying her masterpieces, she held a number of roles in her community. She was the parish secretary of the St. Lawrence Catholic Church from 1977 to 1980, a member and director of meetings for the American Institute for Biological Sciences from 1985 to 1993, the executive assistant to the president of Lawrence Technological University from 1993 to 1995, and a teacher of art at the New Orleans Jewish Community Center from 2002 to 2005. Additionally, Ms. Jordan has served as the president of the Louisiana Watercolor Society, an associate of the St. Tammany Art Association and the New Orleans Art Association, and a member of the awards committee of the National WWII Museum. She maintains positions as a board member of the International Dominican Foundation and as a workshop director of the Louisiana Watercolor Society. Ms. Jordan’s hard work and dedication have earned her a number of accolades. She was inducted as a signature member of the Louisiana Watercolor Society in 2001 and won first prize at the Louisiana Watercolor Society Member Show in 1999 and 1996. Further, she was featured in the International Artist Publications book, “100 Ways to Paint Flowers and Gardens,” and in the Gulf Coast Arts Review and Madame President, as well as in several editions of Who’s Who in the World and Who’s Who of American Women. In her spare time, Ms. Jordan enjoys reading, painting, gardening, and spending time with her grandchildren and great-grandchildren.